Edward Redlich and Chris Spear of ComReal Miami, Inc. announce the sale and purchase transaction of a 24,000 sq. 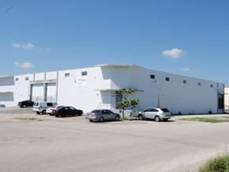 ft. warehouse, located at 2400 NW 150th Street in the Opa Locka-Hialeah area. The sales price was $1,100,000 paid “all cash”; no financing. The Seller was 2400 Holdings; the Buyer was Eight Investment Corp. The Buyer is in the auto parts manufacturing business and is originally from Venezuela. ComReal Miami continues to serve more international companies than ever before. We have recently assisted companies from Hong Kong, Colombia, Spain, Peru, Venezuela, Brazil, Argentina and more, all looking for warehouse space here in Miami.